We are big fans of Trunki. Each child has a Trunki suitcase (you can read my review here), and they love packing them and taking them along when we go away for the weekend or on holiday. Recently I was sent a Trunki PaddlePak to review, filled with a selection of picnic treats from Ella's Kitchen. 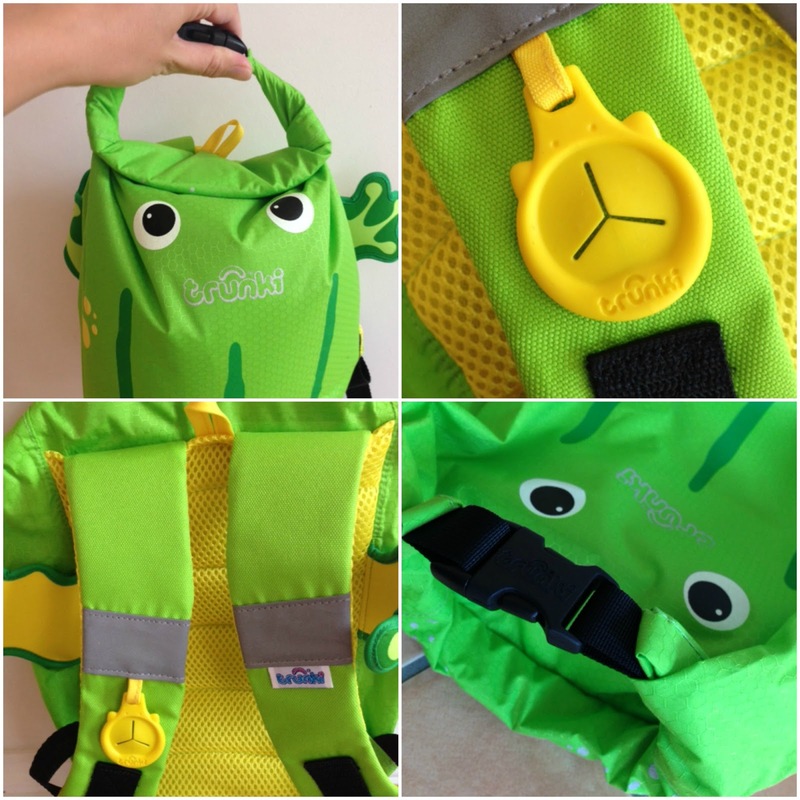 The PaddlePak is a small backpack, available in a wide range of cheerful, fun designs. I chose the Ribbit design as I knew that it would appeal to both children. All PaddlePaks are water resistant, making them great to use as swimming bags or for taking along on days out where you might encounter water from outside (like rain, waves or puddles) or water from inside (like wet clothes or leaking drinks!). We took the PaddlePak along as we ticked off another item on my Summer Holiday List - a picnic in Highdown Gardens with some friends. Highdown Gardens is a beautiful spot, just outside Worthing in West Sussex. The gardens have plenty of space for children to run around and some lovely flat lawns for picnics. The children played in the artificial pools near the larger fish pond and hunted for sticks and leaves, then ran around the Chalk Gardens while the Mums sat down for a catch up. Then the children joined us, and we sat down to eat our picnic. The PaddlePak is very light and comfortable to carry, and has plenty of room inside. I was the one mainly carrying it on this occasion, and I found it easy to hold with a small handle at the top. The opening is a bit unusual. It has a very wide open top, and then to close it you fold it over three times and secure it in place with a child safe buckle. Once you've seen how it works it's very easy to do, and small children can open and close it easily with plenty of room to access the things inside. There is a little zipped pocket on the bottom for small items and a rather clever clip on one strap which can be used for attaching things like sunglasses or a sun hat. The shoulder straps are adjustable and fitted both children well. The PaddlePak would be great for all sorts of things - school day trips, as a swimming bag, taking things to visit friends for a day or for using on day trips. We also enjoyed our Ella's Kitchen snacks on the picnic. They are aimed at toddlers aged 12 months plus, and perhaps suited a little better to younger children, as mine are used to snacks with a little more flavour to them. Mia did enjoy The Yellow One fruit smoothie pouch, which is a nice handy container for taking out and about. The Cheddar and Leeks Multigrain Wheel snacks were popular with the younger toddler in the group, and the Raisin and Spelt Cookies also went down very well. With such a wide range of tastes and flavours in the range there is plenty of choice for parents with young children that have just started on solid food, I know that even now I always carry some sort of snack in my bag for those tricky moments when a small child needs something to eat, and there are some great choices here. We had a lovely day out! I received a Trunki PaddlePak to review filled with a selection of treats from Ella's Kitchen.